Kagamiyama Tenmangu is hidden away on a large hillside right next to Route 9 as it passes through central Hamada. It is reached through a narrow alleyway and then a long flight of stairs. As is often the case, the shrine is located right next to a small temple, and in all probability they were one and the same place until the government executed shinbutsubunri, the seperation of buddhas and kami, in the mid 19th Century. The main kami of the shrine is Tenjin, the kami of scholarship and poetry. There are 2 secondary shrines, one an Akiba shrine, a very popular kami spread throughout Japan by yamabushi, and an Ebisu shrine. The shrine does not appear to be used much, probably owing to the fact that 100 metres away is a branch shrine of Izumo taisha, which is very popular. Route 9, the main road through Hamada starts in Kyoto and runs all the way to Yamaguchi. It follows the ancient Sanindo, one of 7 roads that radiated out from the fledgling capital in Asuka, near Nara, in the 6th Century when the Yamato were beginning to consolidate their control over Japan. Nowadays Japanese farmers rely heavily on chemical pesticides on their crops, but before such things were available they turned to the world of the spirits for help. Performed now as a folk dance, Mushiokuri Odori, sending away the insects dance, was a religious ritual performed in many parts of the country. Ancient Japanese religion concerned itself a lot with pollution and purification. Infestations of insects were considered a form of pollution caused to a certain extent by the "sins" of the villagers. Wearing summer yukata, and accompanied by flute, the drummer dancers make their way around the village stopping and performing the songs. Accompanying the procession is a straw effigy, nowadays carried in a small pick-up. He represents Saito Sanemori, a samurai who was killed and unceremoniously dragged across a rice paddy by his horse. He represents another aspect of ancient Japanese religious tradition, that of the "angry ghost". The straw doll is a form of scapegoat. The "sins" of the villagers are collected by it, and after the rituals it is burned or cast into a river, both forms of purification. Miyajima, the popular tourist destination in the Inland Sea near Hiroshima City is home to many deer. Since ancient times the island has been sacred, and it was only relatively recently that people were allowed to live there. Even now only the village around Itsukushima Jinja, the World Heritage site in the north-west of the island, is the only developed area on the island. One consequence has been that the forests of Miyajima are virgin, a rarity in Japan. Another consequence is that the native deer have never been hunted, and so have no fear of humans. The deer wander anywhere they want, and now that the hordes of tourists can buy food to feed the deer, they come into the village every day. At night they return to the mountains and forest, and so are still wild, though at the same time quite tame. Japan consists of more than 6,000 islands, about half of which are inhabited, so any "typical" Japanese landscape would have to include the sea! This view is of the Inland Sea off the coast of Yamaguchi Prefecture. Tsunozu's Otoshi shrine is in the old part of the village where a maze of alleys and narrow roads and traditional houses are still maintained. Most villages have old sections like this. It's matsuri day, so the streets are lined with shimenawa, fresh bamboo, and shrine banners. The shimenawa lining the streets are to protect from evil as the kami will be passing by later in the matsuri procession. At the shrine the flags are out in celebration of the matsuri, which occurs after the harvest in early November. As well as the main kami, Otoshi, there are secondary shrines to Inari (Otoshi's brother), Omoto, the local land kami, and konpira. The mikoshi stand ready to be carried through the village later. While I was visiting the shrine the ceremonies were underway to transfer the kami into the mikoshi. One of the 2 komainu (Korean Lions) flanking the steps up to the shrine. These are a fairly standard modern design. Mr Kono is the priest of the shrine. He is also responsible for 9 other shrines in the area, but even so his duties do not pay enough to make a living. Buddhist priests have the VERY lucrative funeral business to pay their wages, but other than at major shrines, most Shinto priests must work at a regular job. The main terminal building at Kansai International Airport opened in 1994. Designed by Renzo Piano, its designed in the shape of a wing. Built on a man-made island, at the staggering cost 0f 15 billion dollars, the terminal feels light and airy and spacious, and this is somewhat due to the design, but also due to the fact that it is not a very busy airport. Landing fees are very high, and with the recent increase in fuel costs the number of flights continue to decrease. Though I don't travel often, I have spent a lot of time in airports, and KIX, is the most comfortable I've encountered yet. Giant funnels blow air up to the roof, and the air then circulates naturally, driving giant mobiles. I've spent several nights at KIX waiting for early morning flights, and it's been very comfortable. Everything closes down for the night except a new 24-hour Internet cafe, The Kankyu Lounge. The rice harvest has been underway for a few weeks now. Mostly it's done on weekends or holidays, as most rice farmers have full time jobs doing something else. Some people use combine harvesters that cut the rice and strip the grain in one operation, and some just cut the rice and let it dry. Temporary drying racks made from Giant Bamboo are a common sight now. In a village up in the mountains near Iwami Ginzan, the farmers build an unusual support to hold the drying rice. people come from all over to photograph it. The rice is taken to the mill building that every settlement has. The motors hum non-stop for weeks as the rice is hulled. Behind the shed the rice husks collect into piles. The husks are used as mulch in our vegetable gardens. It is often said that Japan's grossly ineffecient rice harvest is funded by the LDP as a way of wooing the rural vote - a rural vote can be worth 3 or 4 city votes-, but I think there is another reason. The money the farmers receive doesnt stay with the farmers, it ends up in the coffers of the zaibatsu. Rice farming is completely mechanized, with every farmer owning many pieces of equipment, often only used once a year. As well as the equipment manufacturers, the chemical companies also make a fortune as Japanese farmers use a LOT of chemicals. Tenjin is known as the kami of scholarship. If you want help to pass exams you go to a Tenjin shrine. Originally Sugawara no Michizane, a high-ranking government minister and poet in the late 9th Century, he died in virtual exile in Kyushu after falling from favor due to the machinations of his enemy Fujiwara no Tokihira. After his death a series of plagues and calamities befell Kyoto which were blamed on Sugiwara'a "angry ghost". To appease his ghost he was posthumously restored in rank and enshrined as a kami. The Tenjin dance is a straightforward sword fight between Sugawara and Fujiwara, with Fujiwara being killed. The video I posted here is from the Tenjin dance. This draincover is from the island of Ama, one of the Oki Islands lying off the coast of Shimane. It depicts 2 villagers dancing at the annual Kinnyamonya matsuri, the largest matsuri on Ama. Among the many matsuri activities is a dance with more than 1,000 people that includes banging rice spoons. The Oki Islands were a place of exile, and are still removed from mainstream Japan. The people are very friendly, the waters around the islands are clear, clean, and beautiful, and life there is slow and relaxing. It's one of my favorite places in Japan. The Meiji Restoration of 1868 is inaccurately named. There was no restoration of a previously existing imperial system, but a complete reinvention and manufacture of a new imperial system. At that time the vast majority of Japanese had no idea who, or what, the emperor was. Faced with creating a modern Nation-State out of a diverse collection of horizonatally seperated domains and provinces, and rigidly separated vertical classes, the new leaders of Japan chose to build an imperial system to serve as the unifying paradigm. 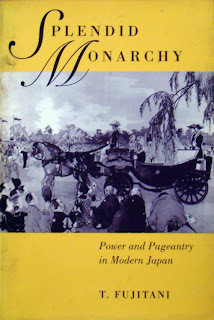 As with so much of the new Japan, they looked to the West for models, and in the case of the imperial system, to European monarchies, especially Britain's. Fujitani focuses mainly on the external public forms, the new state ceremonies and great public buildings, but there is a lot of fascinating background on the creation of the new religion of State Shinto,- the destruction of local nature-based shrines, the suppression of "superstitions", the creation of national shinto ceremonies, Yasakuni, the enshrinement of emperors, and so on, as well as the rewriting of history to make the imperial system central to Japanese history. All Nation-States have used "invented traditions" in their creation, but what comes across in Japan's case is not only the extent and number of these invented traditions, but the fact that they are so widely believed, by Japanese and foreigner alike, to extend back into Japan's past. Perhaps the clearest example of this is the "traditional" Shinto wedding. I personally have asked more than one hundred Japanese of all ages when this "ancient" ceremony began, and so far I have not been given a single correct answer. The very first Shinto wedding was held in 1905, scarcely 100 years ago, and it was modelled largely on the Christian Royal Weddings of the British monarchy. A fascinating book for those who wish to learn more about just exactly how modern Japan is, and the massive disjunction between modern Japan and its past. Looking into the eye of a whale..... a Mountain Whale,..... which is also known as inoshishi,.... a wild boar. It was called mountain whale as a way to circumvent the proscription against eating meat. A whale is a fish and therefore exempt. Rabbits are classified as birds for the same reason. Monks and buddhist priests, and devout buddhists, ate no meat, but most Japanese ate any meat they could get,... frog, snake, badger,.... dog was popular in Edo. Inoshishi are classified as a pest as they destroy many gardens. My own gardens have been raided several times. Last autumn my neighbor set a trap next to one of the tracks that the boar were coming out of the forest on. In 3 months he caught 3 full-size boar. We no longer have a hunter in our village, so a friend from another village was called and he dispatched the beast with one shot. The tail is cut off so a small bounty can be gotten from the town council. I have read that in parts of Japan many boars are killed as pests but the carcasses just burnt. Round here inoshishi meat is prized, and from each one caught I got a leg and the ribs. Fresh boar meat is tender and very tasty. Yesterday was the annual Gotsu Kagura festival. 7 hours of exciting entertainment for less than the price of a movie ticket! Kagura is sacred dance, and its home is in the local shrine, but here in Iwami, kagura has become so popular that various opportunities exist to see it outside of the shrine matsuri. Many towns now have an annual festival held in school gyms or auditoriums. Rather than seeing one group perform all night, up to 10 groups each perform just one dance. It's a kind of showcase where groups can see each other. Being performed on a large stage rather than the usual small kagura space in a shrine means that dances with larger numbers of participants can be staged. One of the common features of most kagura dances is combat. Bows and arrows, halberds, and swords are used. The theme of many dances is the triumph of good over evil, and in many cases this means the the Yamato defeating their enemies. With the faster 8-beat kagura of Iwami some of these sword battles can be quite exciting, as can be seen in the short video. The annual matsuri for a shrine will usually include a procession. The details differ a little from shrine to shrine, but the format is basically the same. This procession is being led by a Tengu, a kind of forest goblin commonly associated with yamabushi. Next up is a Shishi, chinese lion. This was the first time I'd seen one in a procession. The taiko is normally carried suspended from a stout piece of bamboo by 2 men, but this was pulled in a purpose-built taiko cart. I was particularly impressed with the seatbelt that the drummer is wearing. The children's mikoshi comes next. The kids get half a day off from school for the matsuri. Next come the larger and heavier mikoshi(s) carried by the village men, and occasionally women. Nowadays, if the village is large and the population dwindled, the mikoshi sometimes are carried by small pick-up truck. After the mikoshi come the priests and shrine assistants, followed by the Miko who earlier danced for the kami. Sometimes the mikoshis will stay at different spots around the village so that further ceremonies may take place. All these photos are from the Tsunozu matsuri held in the local Otoshi shrine in the first few days of November. This could be a danchi, or it could be a mansion. The distinction between the two is now very blurry. Danchi were originally created by the government in the 1950's to solve the severe housing shortage in the cities that were filling up with people moving in from the countryside. Danchi could only be rented, not bought, and the blocks tended to be plain concrete. The private sector responded by creating "mansions", which were often slightly larger apartments (but still tiny) that could be bought or rented. Typically the buildings exteriors were clad in tile. Like so many shrines and temples, Otosho shrine in Miyoshi is at the top of a flight of steps. Otoshi, one of Susano's many sons, is a tutelary kami of grains, and therefore Otoshi shrines are fairly common. It was New Year when we visited, so the mikoshi were on display. Like all the old-time kami, Otoshi sired many kids by many mothers. A good proprtion of his offspring are kami that were known to be worshopped by immigrant groups in ancient Japan. It was here that I first really noticed shimenawa (sacred rope) made of artificial materials. The traditional material for shimenawa is rice straw, but nowadays one sees more and more made from various types of plastic. The centrepiece of Nima's sand museum is the largest sandtimer/hourglass in the world, 6 metres in height amd 1 metre wide, it contains more than 1 ton of sand that takes a year to flow through the narrow gap. Every New Years Eve the timer is lowered from its position high up in the main glass pyramid of the museum and invited guests turn it 180 degrees to begin a new year. Other than the sandtimer there is not actually a lot to see at the museum...... there are a few artworks using sand, and a collection of sands from around Japan, but not much else. The outside of the museum, designed by local architect Shin Takamatsu, is more interesting.